Massachusetts Historical Society is exhibiting Fashion the New England Family, 17th to 19th Century: Reuse, Refashion, Preserve, and Pass Onallowing visitors to learn about the importance of fashion in history. Many pieces were have been in long term storage and are being exhibited for the first time. MTS conserved five historic garments for this exhibit including Mather Byles christening cap. The exhibit opens October 2018 and closes in April. 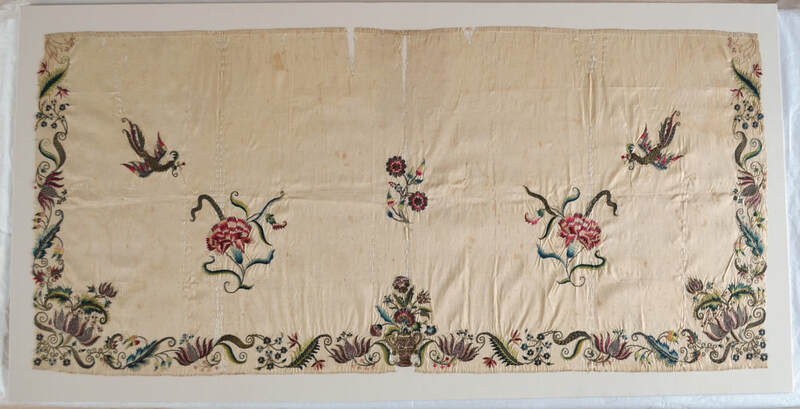 Embroidered apron conserved by MTS. Photo courtesy of Massachusetts Historical Society. Trustees of Reservations will be exhibiting Leisure Pursuits: The Fashion and Culture of Recreationdisplaying how people of Massachusetts participated in activities such as gardening, swimming, entertaining, fitness, and equestrian pursuits. Each of these activities required a certain dress and influenced the fashion of the time. MTS had the opportunity to conserve several pieces for Trustees of Reservations. This exhibit will be showcasing what was worn for certain activities and opens May 12, 2018. Detail of a Driscoll's gown conserved by MTS. Photot courtesy of Trustees of Reservations. Click here to learn about our Past Exhibitions.